I love having crab that's cooked with the basic stir-fry garlic and onion, then covered to steam up in its own juice. Consume as is, or have a really sour vinegar with crushed garlic dip and it's one unforgettable hands-on meal! One night, my wife prepared crab with shrimp paste, and I loved it too! Now I found two ways to enjoy crab, and both are very easy to do. Heat up oil on medium heat. Cover the pan and let cook for 15 minutes. The crabs will turn a bright red color as they cook. Open and add the shrimp paste. Mix and cook for a couple more minutes. That sounds yummy! Crabs are sooo delicious. I do indulge in their fat sometimes. :P I like this best steamed in their own juices, yes! I haven't tried it with bagoong yet but it sounds like a great idea! Crucial part of the recipe yun. haha! 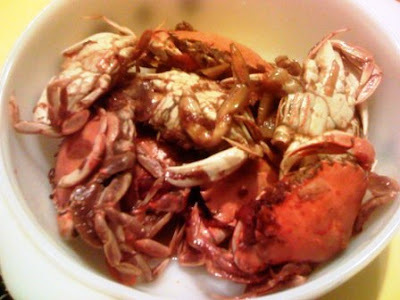 had crabs yesterday kaso payat lol...miss the fatty ones at home!